West India Islands. / Martinico. / Dominica. / Cul de Sac Royal. A fine example of John Thomson's stunning c. 1814 map of the West India islands of Dominica and Martinique. 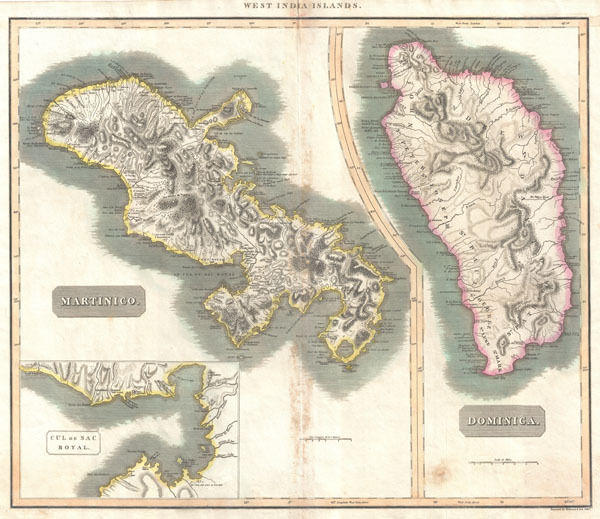 Divided into two sections, this map offers spectacular detail of these two picturesque islands. Both sections offer detail to the level of individual buildings noting churches, convents, villages, hospitals and forts. Also notes some sailing hazards and portages. Both also show mountains, rivers, caves, forests, and river systems. In the lower left hand quadrant there is an inset of the Cul-de-Sac Royal (modern day Fort-de-France). Engraved by Kirkwood and Son of Edinburgh for the 1817 edition of John Thomson's General Atlas. Very good. Minor offsetting and some spotting along original centerfold. Blank on verso. Rumsey 1007.072. Phillips (Atlases) 731. Newberry Library: Ayer +135 T4 1817.